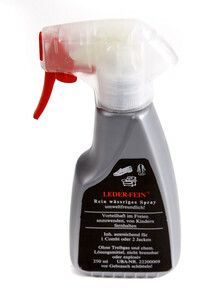 Care and waterproofing spray for all types of leather (e.g. suede, nappa, nubuck). The protective spray is simply sprayed onto the leather which is thereby more impregnating and water repellent. Also, the spray provides good protection against stains and dirt. The leather impregnation spray is environmentally friendly and significantly different from conventional and harmful products.